Obsidian is a black, extrusive igneous rock that is often called volcanic glass due to its absent crystals and glassy appearance. Major minerals include feldspar, quartz, and mica. 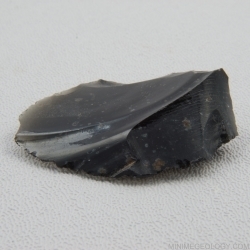 Obsidian cools so quickly outside of the volcano that individual crystals do not have time to grow.